This level has medium difficulty. 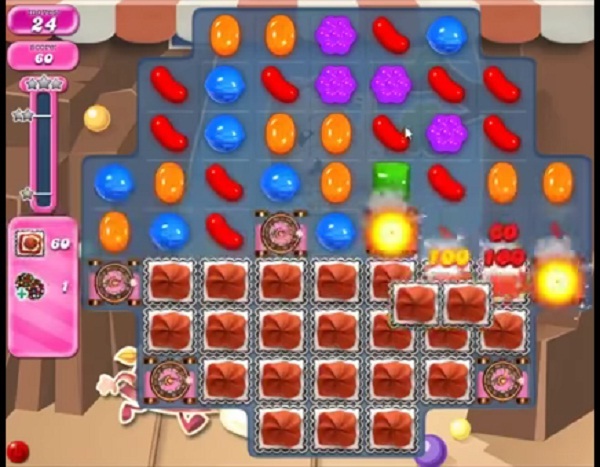 For this level try to play more near to blockers or to bottom part of the board to shuffle the candies. Combine special candies with each other to break more blockers or make colorbomb by combining fice same color candies. The board I am playing looks the same but does not react the same. I have played it over 50 times and can’t even get close. I’ve tried using boosters and that doesn’t work . It blocks my path with the white fluffy things six or seven at the time with every play. What do I do? I have played some bad levels, but this is the WORST EVER!!!! you don’t have a chance, and no don’t use boosters, just a waste. Nothing to do on this level, but hope for a lucky board!! I bet this is pc board? On iPhone it is IMPOSSIBLE. Just have to wait for the game to make it a bit easier, happens once in a while. Im sure they see no one gets by it. This is not the board I have on my ipad or iphone. It is not possible to do. I may have to quit. Mom oh mom how can I describe this level. This level is brutal. Can’t even get to first two spawned, pleeeeese help ???????? My level 1864 not the same as tips and walkthrough. I need toget 150 icing blockers in 22 moves which is impossible. After 5 to 10 moves the board is covered with icing and NO MORE POSSIBLE MOVES? Sooooooo disappointing I cannot get through it. Can you please fix the problems with this level ? Another level from hell by king. No strategy helps..nor do boosters. You are out of lives in minutes. As bad as a timed level or worse. The PC board is completely different. Don’t even bother trying to play the game on a tablet or mobile device until they change it. I agree that it is impossible on iPad or phone devices. The PC board is hard but achievable. Switch to PC and I am sure you will get past it and then you can move back to your usual device and carry on as normal. Has to be hardest level..is there any help…. I can only play on iPhone, should I just quit for a while? RIDICULOUS LEVEL! Not the same board as video. 22 moves and need 150 blockers..IMPOSSIBLE WHEN YOU CANT BREAK THE SPINNERS CAUSE THEY SHOOT OUT ICING IMMEDIATLEY and A LOT OF TIMES compared to video! FIX THIS! Up to this level I have enjoyed CC, looks like this is a level created which may cause me to delete this game. ABSOLUTLEY IMPOSSIBLE LEVEL! What are pple. thinking! You should play the board must of us have compared to yours and see how far you get. Have no reason to keep playing. This is the worst level ever. Please look into why it is this way…not good! We need help. The example you give to go through this level is not the same as on the iPad. Every time I knock one out it is replaced with five of six. It is not possible to win this on the iPad, no matter what anyone says. Fix this level or you will get no more of my money and I will go back toAngry Birds. This is impossible on my iPad!!! On the computer it is completely different……please fix!!!! Seriously, how many lives do you have to go through before you get a board that will let you beat level 1864? Why does it have to be such a HARD LEVEL? It seems that all previous comments have been ignored to fix the level which is sad. Horrible level! First time in 3 years that I actually feel like deleting the game and I’ve gotten so far. Anyone have any pointers ??? Même problème que les autres joueurs :150 breaks en 22 coups sur ma tablette et 3 coups suffisent pour faire démarrer les machines. What can be done to beat on iPhone? It is impossible. Help!! 1864 completed! 8 boards! I’m playing on an iPad, after reading all the comments I figured it was over 4 me. I was able to clear top right spinner and was able to stop the influx of frosting blockers 2 complete level. 1864 a hellish game on iPad ,it’s different to one showing here 150 blockers and no coloured bombs !!!!! After several days and the closest I came was down to 28 blockers left .. had a go on kindle and , thankfully on there was the same game shown here 28 icing and Double cb…. this was so simple in comparison to game on iPad … done in about a dozen attempts .. would say that game on iPad with so many blockers is crap ? !! Add me to this frustrated group. I play to get to relax, unwind, and put a bad day behind me. This impossible level leaves me more wound up than the day’s events I’m trying to escape. What’s the purpose of this level, King? There’s nothing enjoyable about it. This level is impossible 125 blockers in 22 moves it is different to the video please help !!!! This another typical board that is not like the video board. Impossible to get unless you can break the spawners. Another facade. Change this game to make it the same as the video – 60 blockers and 1 double colour bomb. What is your problem with 1864? Why isn’t it the same as the videos? Not fair and just making people quit this unfair playing field. King notified some players and verified 4 months ago that they would fix this level. Well, we are still waiting. If not done immediately I Quit and you will never hear from me again. To get this far and realize that you are not getting the fair game that is on the video. Not a very reliable company to duke your customers this way. Would like a response from King. This is rubbish! No chance! Been stuck on 1864 on my iphone FOREVER. Never had a level like this. Never mind that your game is over in 2 mins. Lives exhausted in 5 min. So instead of playing for hours, I get 5 min and done. This is crap!! !